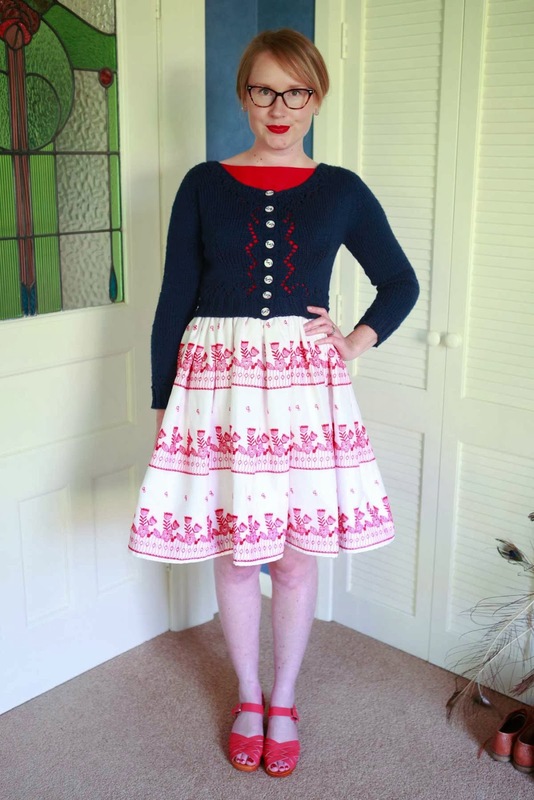 I know we’re mostly supposed to just post about sewing here on We Sew Retro, but I have seen a few gorgeous knitting projects pop up from time to time and I’m so proud of the first knitted garment I’ve ever made, that I couldn’t help but post it here. 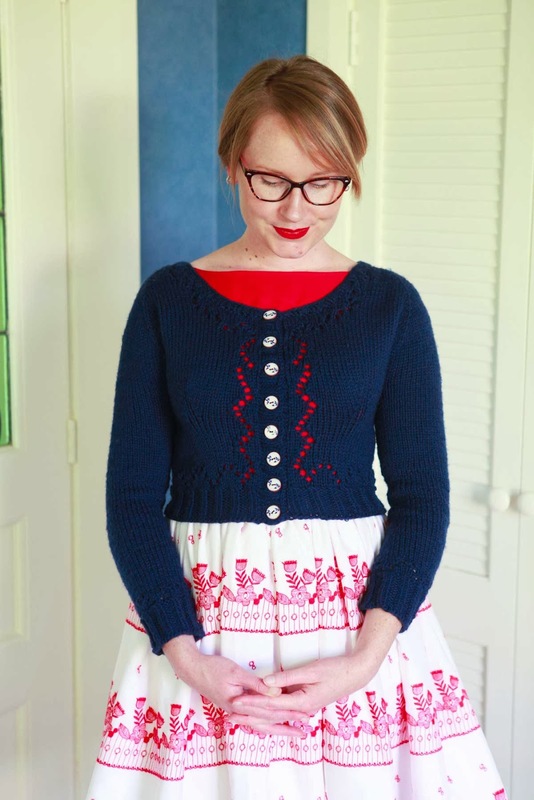 While we’re only one month into 2014, I think it’s safe to say that my Navy Miette will probably be the garment I’ll be most proud of in 2014. It’s wearable, comfortable, warm, soft and, if you don’t mind me saying so, it’s DARN (yarn?) CUTE! My Miette is in no way perfect. There are places where I lost count, couldn’t remember what row I got up to or dropped stitches. There was even that time I knit my first sleeve on the wrong sized needle and I didn’t have the heart to frog it so knit my second sleeve on the wrong size as well so that they would at least match…um, yeah. I also probably should have knit up a size larger in the bust – it’s not a major issue fit wise, but the shaping around the bust stretches a little too much for my liking. I guess figuring out negative-ease comes with time. The only major thing I changed was to add 30 extra rows to the sleeves to make them longer and therefore more winter appropriate. I found that if I stopped where the instructions told me too then the sleeves would have been a weird length on me – too short for bracelet length, but too long for short sleeves – and I probably wouldn’t have ended up wearing it. I also opted to leave out the buttonholes in the pattern instructions. Instead, I hand-sewed on navy grosgrain ribbon to the back of each button band before doing them by machine. In hindsight, I’m not sure I’d do it this way again, but it works for this cardigan and I’m happy with how they turned out. For more pictures and information about my Miette, you can pop over to my blog or Ravelry note page. Do any of you knit as well? Lovely work. I think I’m about to brave that same sweater pattern. I’ll be doing long sleeves as well. Thanks so much Stephanie 🙂 I totally recommend you brave this pattern! It looks more complicated than it is, promise!! This is lovely and especially for a first timer. Well done it looks great. Gorgeous. I am impressed by your skills for a first time knitter, well done! Keep it up! Thanks Anna, I’m about to start on my next project, yay! I love your sweater! So cute with that skirt. Excellent work. The one time I knit a sweater for myself, it fit my husband. Now I stick with sewing. Haha, yes, negative ease and ease in general with knitting is a tricky one to figure out! I think more and more patterns are breaking down working out fitting better though than they used to. 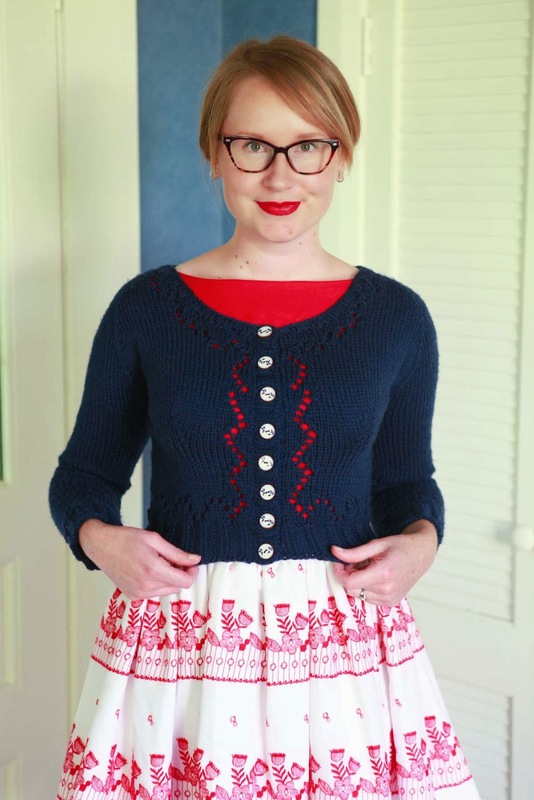 Perhaps you could try a modern pattern if you’re thinking about returning to knitting? That is so pretty! How is that your first knitting project?? This gives me hope :). I knit too, this is adorable! I am just knitting this in red and am fretting that it might be a bit small. I’m making mine longer in the body and the arms. If it does turn out too tight, I will frog it and redo as it’s a pretty quick thing to knit. Thank you for showing us yours, inspired me to finish mine! I am knitting my very first sweater, too! Thank you so much for posting this as it gives me renewed hope that I actually can do it. I have had a number of false starts, but keep moving forward. Any tips on how you switch from one size needle to another? This is absolutely adorable! No, I don’t knit, but this could certainly make me want to 😉 And the skirt? Adorable as well.